I didn't realize it at the time, but now that I'm putting it down in words, it occurs to me that this was my eleventh E3. Over the years I've stuck to mostly covering PC games and, while that's still one my passions, this was the first time I finally had the chance to break out and explore things on the console side. There were plenty of games that impressed me, but the great frustration of E3 is that there's never time to see everything you want to see. Here's a list of the five games that most impressed me at this year's show. What? Kirby? You betcha! Now, Kirby is not normally my kind of thing, and I was tempted to pass on the demo in favor of spending more time with games like Zelda and Metroid. Fortunately, the PR person's persistence and my own guilt over not being as thorough as possible convinced me to give it a go, and I was really surprised at how much I enjoyed it. The cloth-style aesthetic was brilliant and proved that good graphics are much about design and style as about polygons and framerates. But what really won me over was the cooperative gameplay. Tossing your friends around is always lots of fun and in Kirby's Epic Yarn, it's actually part of the gameplay itself. A few of us were sitting around after the show talking about the games that disappointed us the most and Epic Mickey was one of the titles that first came to mind. I sat down and played a good twenty minutes of the game and came away feeling a little disappointed that my interaction with the game world was a bit too straightforward. The painting and thinning mechanic was interesting and the demo showed off multiple solutions to problems, but I was still expecting something more. After all, this is a Warren Spector game, right? Something about that initial impression bothered me. Once I examined it, I realized that my expectations were entirely focused on gameplay, which isn't what Epic Mickey is trying to deliver. If I had given myself a chance to get swept up in the hype, I think I might have had the same reaction to Kingdom Hearts, which is one of my favorite games of all time. 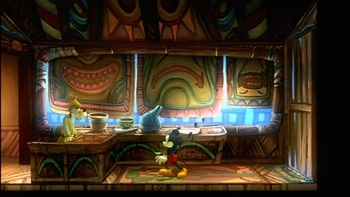 After thinking about, I realize that gameplay isn't what Epic Mickey is about; instead, it's about the exploration of Mickey's world and on that count, the game succeeds amazingly.